…and on the 7th day the low carb gods said let there be carbs and they were good! Entering my 4th cheat day today and I think I have finally come to love them fully. Three times now I have recovered well from the cheat day and lost more weight. As of this morning I am 243.8lbs. I have been losing weight at an average rate of 0.7lbs a day. I have lost 19lbs since the start of project guinea pig. I have just 44lbs left to lose and I will be under 200lbs for the first time I can remember!!! 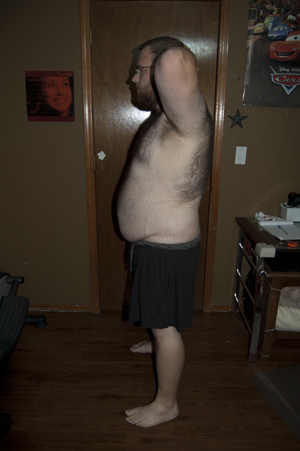 I updated my progress pictures but here are the side shots. I can’t tell a lot of difference in the front and back, but the side shots really show. 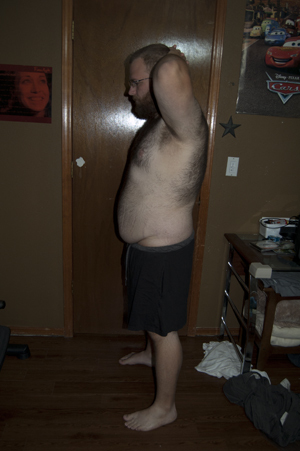 When I started low carb eating on June 15th, 2011 I weighed 269.2lbs and wore a size 40-42 pants. Now I wear a size 36-38 pants. I now have to wear a belt with my size 36 shorts from Old Navy that I just bought! I’m pretty excited and am not really afraid of the weight coming back like I have been with past diets. They say any diet will work as long as you can stay on it, and this is true. However the low cal – low fat – high carb diets are IMPOSSIBLE to stay on for life. The low carb, slow carb, paleo, primal, or whatever you want to call it is the only way of eating that I have found that is truly a way of life and EASY to follow for the rest of my life. Today will be good too. Started the day with bacon and waffles with real maple syrup! For lunch we are going to Golden Corral, and then to a new (to us) mexican restaurant with family for dinner. Happy cheat day to all who participate! I’m happy for you! Enjoy the day! Thank you! I definitely will enjoy it. Especially now that I know how to counter act the side effects of eating junk! Thanks! It’s hard to see change day-to-day but I definitely see the change now! I laughed when I thought of that title and just had to use it! Awesome progress Aaron! The changes are remarkable. Enjoy cheat day, I know I will. Thanks! I’m about to go kill a Golden Corral buffet! I think I will actually end up eating pretty low carb just because I’m going to want so much of their meat! Well done! You have really hit your stride. What is the hardest part of your journey? Really the hardest part of this journey is over coming my issues with not feeling good enough. I always try to do better than I am even though I am doing amazing so far. I’m getting better at that every day though! Thank you! Congratulations on the success with your med reduction!